A very different response to the national trend for increasing disciplinary exclusions is presented in this report by Giles Barrow which describes an inclusive approach to disaffection and disruption in the London borough of Merton. This is an account of the successful development and growth of the inclusive education service in the London Borough of Newham over 1984-2002. The authors, Linda Jordan and Chris Goodey, were among leading figures in the change towards inclusion. This is the story of the continuing education and life of Kirsty Arrondelle, a young woman who enjoys membership of many groups in her local community, both within and outside of formal education. She also has Down's syndrome. This report, by Dr Sharon Rustemier, documents Kirsty's social and educational inclusion in adult life and links this with her parents' struggle to secure mainstream education for their daughter. This report by Alison Wertheimer reflects the growing international movement calling for inclusive schools which welcome all children. Inclusion, it says, is an issue of basic human rights, and not primarily an educational or professional issue. It calls for change in the UK law to end current discrimination against disabled pupils. This book from Open University Press (McGraw-Hill Education) is now available from CSIE. Written by Gary Thomas, Professor of Education, University of Leeds and Mark Vaughan, Founder and Co-Director, CSIE, it examines some of the key influences behind the moves towards inclusive education and inclusion in society. The first of its kind, this seminal work features more than 50 extracts from key documents over the years with illuminating commentaries by Thomas and Vaughan. The Index for Inclusion, written by Tony Booth and Mel Ainscow, is a major publication from CSIE to help guide schools through a process of inclusive school development. It encourages the widest scrutiny of school life and involves a self-review of a school's cultures, policies and practices. Through a deep exploration, barriers to learning and participation are identified, priorities for development are determined and plans are put into practice to help build supportive communities which foster high achievement for all students. Price includes FREE 6-page Index for Inclusion insert for schools. 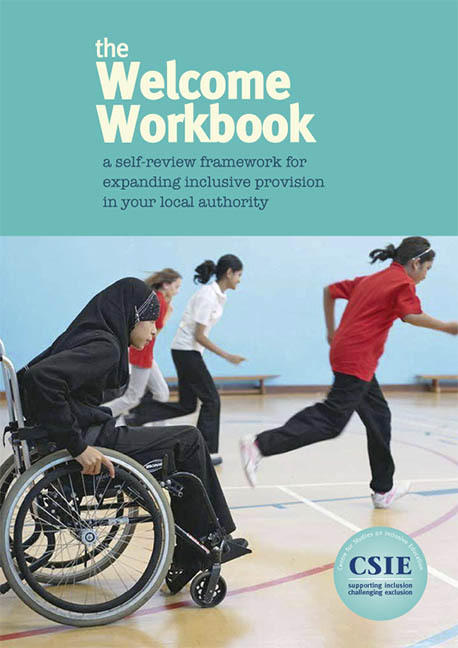 This 6 page document which is included in the purchase of the 2002 Index can also be bought separately in bulk, to help with training and other activities supporting inclusion in schools. This 6 page document which is included in the purchase of the 2006 Index can also be bought separately in bulk, to help with training and other activities supporting inclusion in early years and childcare. This report, written by Sharon Rustemier and Tony Booth, examines the many different ways the CSIE Index for Inclusion has been used by Primary and Secondary schools and by LEAs in England. Using examples and case studies, the report illustrates the positive impact the Index can have on the inclusive development of school cultures, policies and practices. This report by Linda Shaw, Co-Director CSIE, focuses on the work of learning supporters and additional adults in the mainstream classroom and covers roles, rewards, concerns and challenges from their perspective. It also sets an agenda for discussion and development. All LEAs in England are ranked according to their placement of pupils with statements of special educational needs in special schools and other segregated settings. Disturbing local variations in segregation are revealed along with very little progress towards inclusion during the three year period. Essential reading for LEAs, schools, teacher trainers, voluntary organisations, parents, governors and students. This report by Dr Sharon Rustemier puts forward the substantial and persuasive international human rights principles supporting inclusive education. It reveals a catalogue of uncomfortable facts about segregated education in the UK and challenges traditional assumptions sustaining segregation. A look at the evidence and the reasons why, whatever the degree of interaction with mainstream schools, special schools are necessarily segregating institutions. Dr Sharon Rustemier's report draws on the substantial bodies of educational and social psychological evidence to illustrate the damage of this segregation and its links with stigma, stereotyping, prejudice and discrimination.